As frequent readers of this site know, I have been mostly disappointed by the lack of quality aviation apparel available through catalogs, websites or at airshows. I decided to do something about it and create a line of t-shirts inspired by aviation. 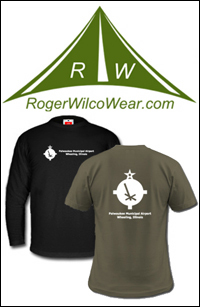 Roger Wilco Wear was developed with the pilot in mind; our line of t-shirts utilize elements familiar to pilots. After spending hours looking at sectionals I realized that images from the sectional chart would make for great t-shirts and many of our offerings feature those images. The site currently features airport specific t-shirt designs including Door County Cherrlyand Airport, Lunken Field Airport, New Garden Airport, Palwaukee Municipal Airport, Van Nuys Airport. Each week we release a new airport specific shirt as our Aviation T-Shirt of the Week. Let me know if there is a shirt you would like to see featured. Additionally, we offer several customizable t-shirts. We have a General Aviation Pilot t-shirt that can be customized to include your home airport three letter identifier. Additionally, we offer custom t-shirts that let you commemorate where you flew your first solo or learned to fly. One last note, our t-shirts are being sold through Spreadshirt.com. They will handle fulfillment of your order and unfortunately, I will not know specifically who has bought a t-shirt. So please drop me a line if you buy one! Great idea! I'd love to see one for AHN! I may have to order a custom one for XMAS. there doesn't seem to be a "send" button for the "contact us" section on the Rogerwilco site. how about an email address? thx! They look fantastic!! Great idea! I'm jealous! I wish I thought of this idea. That's awesome! My wife bought a jacket for me from Sporty's with the tail number from the plane I soloed in. Are you doing well with the stuff? Will you be doing any affiliate sales? Thanks Patch for the kind words. I am having fun with the RogerWilcoWear line! I am looking into an affiliate program and will keep you posted. Wow -- you are one savvy business guy. I don't know half of what you talk about on here anymore, but it looks like you have turned an awesome idea and lots of passion into a little mini-empire. Good luck and have a wonderful holiday. Hope the misses is well too.